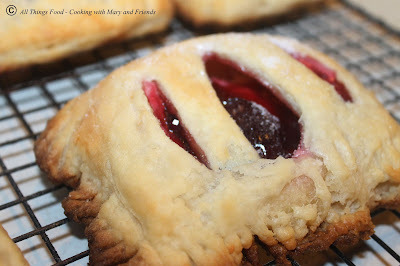 A couple of years ago I found this great EASY recipe for puff pasty from Flour Me with Love and have been making these puff pastry treats ever since. The recipe is easy to follow and simplifies the whole tedious puff pasty process into one very simple to follow recipe. 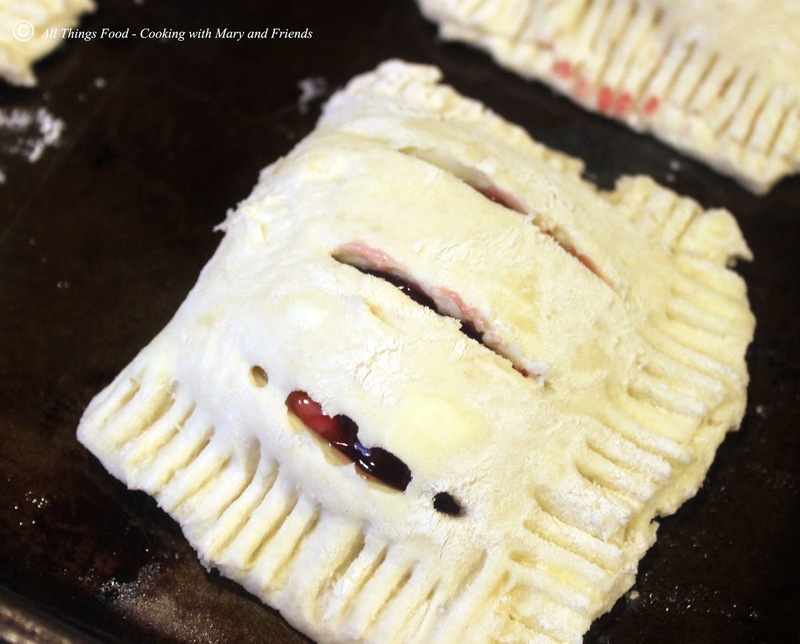 You'll be amazed how light and delicious this puff pastry is! It's so flaky and buttery! This makes the perfect little dessert your family is sure to love, and they'll think you spent hours making it. In a large mixing bowl, combine the flour, salt, baking powder and sugar. Add the cut butter slices and using the paddle blade, cut the butter into the flour until it resembles large crumbs. Mix in sour cream just until the dough begins to come together. Turn the dough out onto a floured board, and quickly knead it together. Roll out into a 12 x 13-inch rectangle. Fold down the top half of the dough then flip up the bottom half so they overlap. Now fold in each side until they meet. You should have a nice neat square. Dusting work surface again with flour, roll it out one more time repeating the folding. It will look much more uniform this time. 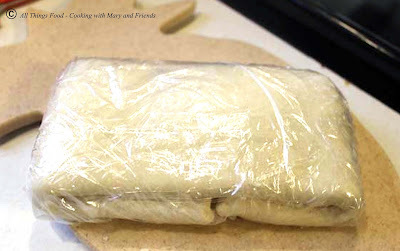 Wrap in plastic wrap and refrigerate 30 minutes or dough can be frozen at this time. While the dough is chilling, beat the softened cream cheese, sugar and vanilla together until smooth and creamy; set aside. Remove dough from the refrigerator, and on a lightly floured surface, roll it out into a large square. Trim sides with a knife or pizza cutter to make even. 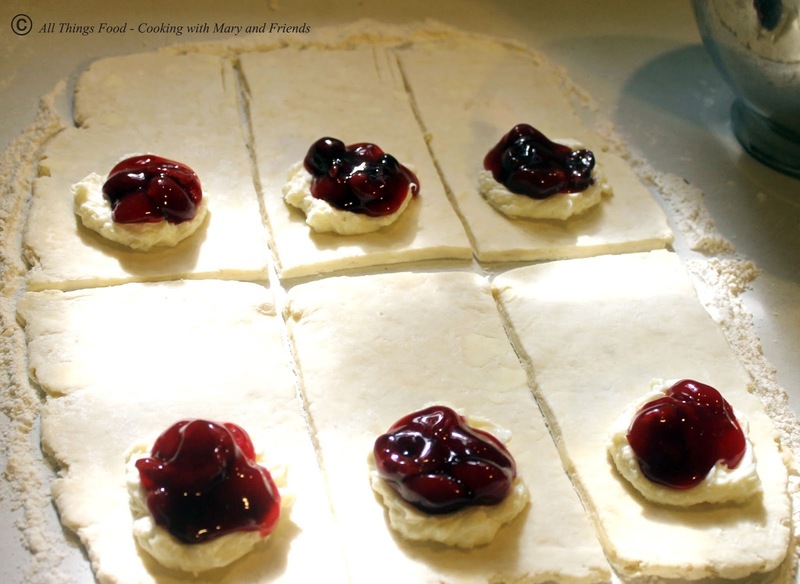 Cut dough in into 6 pieces (cut in half width-wise, then cut 3 vertical slices, making 6 total. Put 1 tbls. cream cheese filling on each at one end of the dough (leaving a bit of space at the very bottom). Use the back of a small spoon to make a small depression in the cream cheese filling. Top it with 1 tbls. of your choice of fillings (see above). 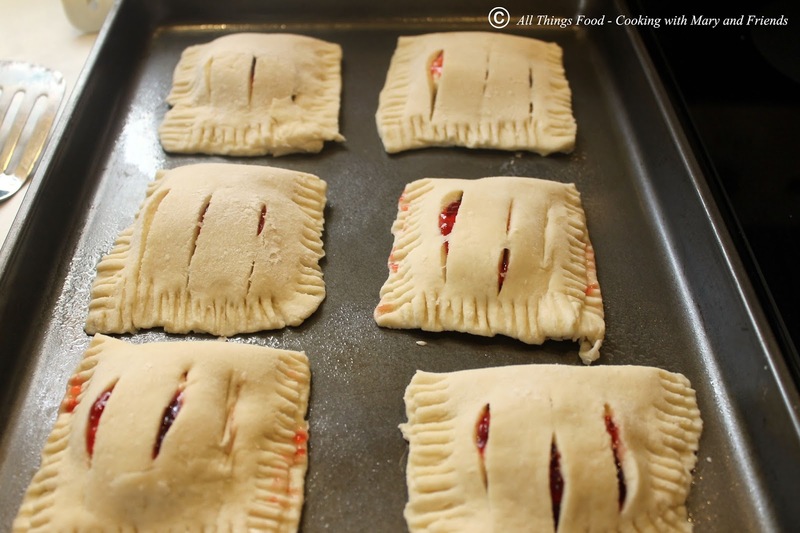 Cut 3 slits into the top section of the dough, moisten all the edges with water, and fold dough over the filling until the top and bottom touch. Using a fork dipped in flour, crimp all around the edges (bottom and both sides) to seal. Place on a large rimmed baking sheet. 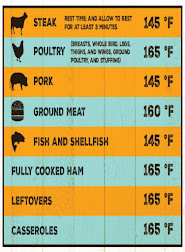 Bake in preheated 400 degree oven 20-25 minutes, or until golden brown. Remove to cooling rack and let cool. Sprinkle tops with sugar if desired.